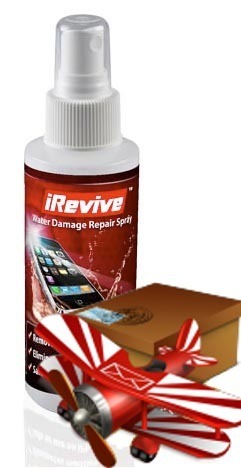 There are 4 water damage sensors located on the iPhone 4. When a water damage indicator is exposed to water or a high level of moisture (sweat) it will turn from white to red. A red sensor indicates the warranty on your phone is void and will no longer be covered under Apple's warranty. 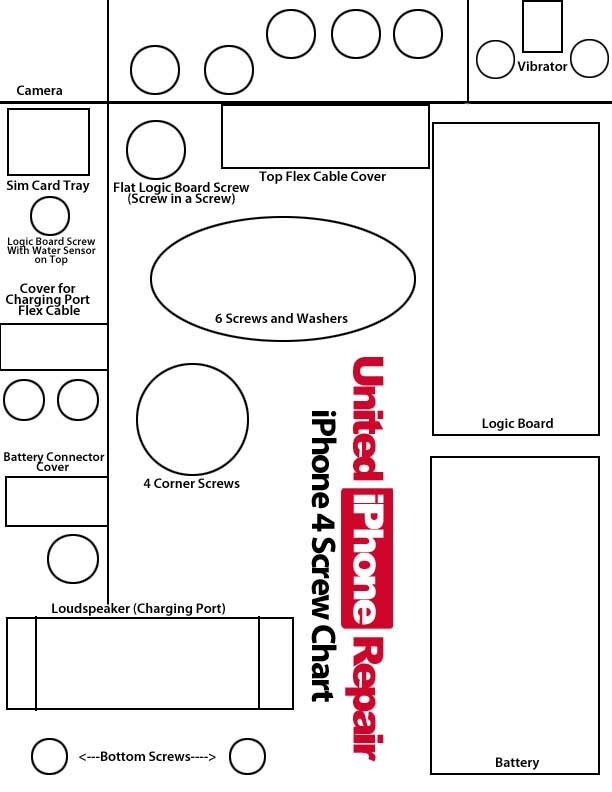 You can click on this image to print out an iPhone 4 screw chart on a sheet of 8.5 X 11 paper. You can keep track of all the screws and parts easily! 0:19min - Power your phone off and then remove the SIM card and two bottom screws. You will use the pentalobe screw driver that looks like a star. This is the only time you will use that screw driver for this repair. 0:33min - Place both thumbs on the back glass and slide up toward the power button on the top of the phone. The back should slide up 1/4 in and then you can lift it off of the phone. 0:43min - Use your phillips screw driver to take out the screw on the battery connector. You can also see the water damage sensor located just above the battery connector. If it is red then water has made it to that part of your iPhone. 1:00min - Once you have the battery cable disconnected use a pry tool or screw driver to lift the battery out. It is held down with adhesive so you will need to pry along the side in a couple different places. 1:11min - Use the flat screw driver to lift off the antenna. 1:25min - Use your phillips screw driver to remove the 2 screws that cover the charging port flex cable. Then remove the plate that was being held down with the screws and use a flat screw driver to lift up the charging port flex cable. 2:03min - Remove the 5 screws that hold the top plate on the phone. Then use a flat screw driver to lift the plate off. Also remove the 2 phillips screws in the top right which hold the vibrate motor then lift the vibrate motor out. Now use a flat screw driver to take out the top (screw in a screw). 2:30min - Use the flat screw driver to disconnect the 6 top flex cables. After disconnecting the cameras flex cable, you can lift it out. 2:49min - On the bottom of the phone, remove the screw on the left side. This is the final screw holding down the board. Gently lift the logic board out of the phone. 3:02min - Use the flat screw driver to work around the plate that covers the logic board. You should be able to pop each tab up, do not use a lot of force to avoid permanently bending the tabs. Do this for the 4 plates that are removeable. There is one plate that is soldered on and can not be removed. 4:08min - Now you have all of the chips on the board exposed you can start looking for any corrosion that has formed from the water damage. 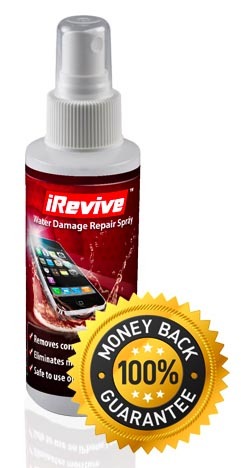 Spray iRevive generously onto the logic board and then use the brush to scrub the entire board. 5:00min - Let the board dry for 30min to 1 hour, preferably overnight. If you can not wait, you can use a blow dryer on the cool setting to speed up the process. Do not use a hot blow dryer. Once you are sure that the board is dry and all the water damage is removed, you can snap the plates back onto the board. 5:57min - Place the logic board back into the phone and reconnect all the flex cables. Replace the camera, flat screw and then the plate with the 5 screws holding it down. Also replace the vibrate motor in the top right corner and its 2 screws. 7:00min - Replace the screw on the bottom left corner and the one midway in the logic board. Then reconnect the charging port flex cable and put the cover back on with the two screws to hold it down. 7:45min - Replace the battery and then snap the connector back into place. Connect the antenna and then replace the screw to hold down the battery connector. 8:00min - Place the back cover back on the phone and then slide down. Replace the bottom two screws with your pentalobe screw driver.